For the second weekend in a row, I ran a game of The Wood at Cobbler’s Nob, set in the Convicts & Cthulhu setting. The first time, at Go Play Leeds, the adventure ran a lot differently to this weekend, at Concrete Cow in Milton Keynes. This Cthulhu Hack adventure starts with character generation, during which I explain that by the start of the adventure the players need to have chosen who will be the guards and who the convicts, with numbers favouring the latter. At both events, the sessions showed that character generation slips by smoothly with a minimum of fuss – and in the Cow session I managed to run a second character generation midway through in a couple of minutes, when one convict died and we needed a replacement. In both adventures, the investigation has led to the characters seeking out expert advice and then coming face-to-face with the horror behind the threat. In the former case, the group took the gung-ho approach; in the latter, the considered one, taking a proposal to the locals that perhaps they should back off. Interestingly, the events in the second adventure wouldn’t have panned out the way they did if the convict hadn’t died. The player played a free colonist as their second character, a resident of Cobbler’s Nob, and they mirrored the feelings of the settlement well. When the truth started to become clear, they agreed with the guards that the way ahead might be to step back. However, it took some thoughtful words and careful planning to get the job done. The system held up well, with less sanity-shattering moments in the second session. The first group really did take the rollercoaster approach – and only one survived. They both found a way to avert the threat of the horror, but just took it in completely different directions. I will try to gather up some notes on the adventure – which came about through reading various source materials, including some aboriginal myths and stories. In the analysis, the horror might be Mythos driven, but could just be something supernatural – I think it might be something left to the individuals playing the adventure to decide. 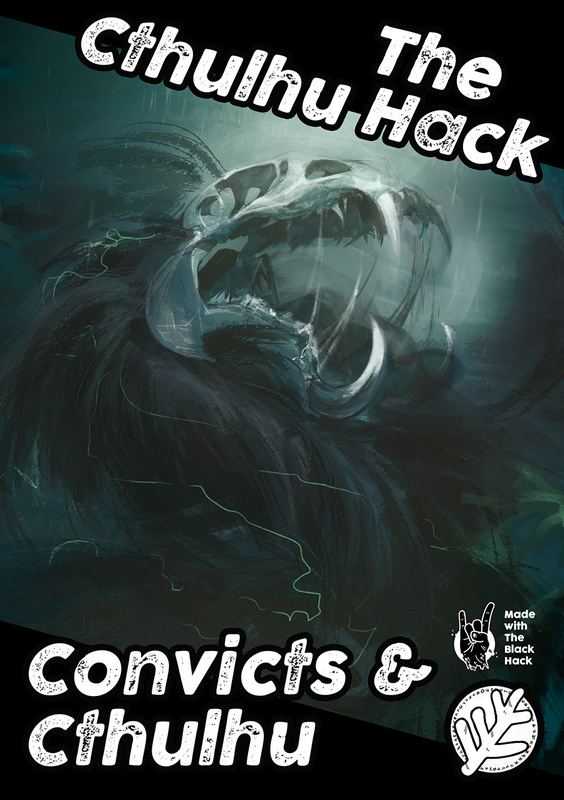 I’m happy with the way The Cthulhu Hack: Convicts & Cthulhu plays as a setting and I can see a lot of interesting potential in returning to Australia. I would ask, if you have good experiences reading, running or playing The Cthulhu Hack: Convicts & Cthulhu, that you pay what you think it’s worth – as I’ll say openly that 85% of purchasers, thus far, have taken the option to pay nothing. This has affected my plans to convert and release The Keepers of the Woods, which I would also make available PWYW. The effort involved in putting these books together is no different to any of the other Cthulhu Hack books, with fixed prices and the artists have been paid regardless. Again – to be open – in both cases, the product has been released PWYW because of the complexities in the licensing, not because of a particular gimmick or wish to experiment. I love the C&C setting and the Keepers adventure – and they have both figured heavily in my testing of the system. Keepers will likely come later in 2017, rather than last quarter 2016. Under any other circumstances, C&C would have been a $2.50 PDF with a physical copy comparable to The Cthulhu Hack in price. You can go back and purchase a second copy of Convicts & Cthulhu at a higher price than the original – and that will make all the difference. It means I continue to support great art for the covers and spend time writing new material. I can also start looking into interior art for future releases and re-releases. I also appreciate your reviews and taking the time to rate or review any Cthulhu Hack product helps other gamers make their decisions to buy into the game. The physical copy of TCH: Convicts & Cthulhu is also Pay What You Want, but with a minimum set at my cost to get the product printed. You’re paying for the layout, printing, the physical product, and the transit – anything else I leave to you. I expect to have it available, initially, only in the boxed sets on All Rolled Up and on the stall at events, including Furnace, Spiel, and Dragonmeet.